Every once in a while I like to post an entrée just to prove I do eat something besides sweets, so here’s a chicken dish which you may find useful if you’re in a hurry. It’s really easy and it pairs well with red wine or white. You can give it a rosemary theme or a sage theme. I haven’t decided which one we like best. Preheat oven to 400 F. Meanwhile, put a large pot of salted water on the stove to boil. Sprinkle each chicken breast with a little salt, pepper and dried herb (rosemary or sage). Wrap a strip of bacon around each piece of chicken and drizzle lightly with olive oil. Bake the chicken for 20 minutes or until it’s done. Meanwhile, boil the pasta for 9 minutes or until al-dente. Drain, but don’t rinse. In pot used to boil pasta, melt the butter and oil. Add garlic and sauté for about 3 minutes. Don’t let it burn. Add the spaghetti back to the pot and toss with the butter and garlic mixture. Toss in the lemon juice. Add salt & pepper to taste, then toss in some fresh parsley. Chicken should be done or just about done. 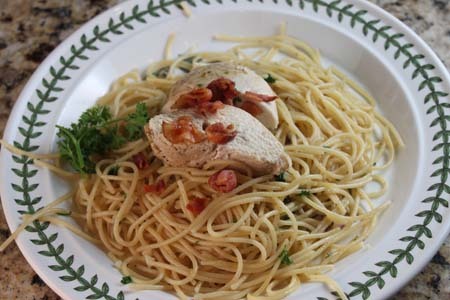 Remove bacon from chicken and lay over pasta. Microwave the remaining two pieces of bacon until nice and crisp, then crumble over top.